Alison L. Carruthers is a litigation associate in the Ann Arbor, Michigan office of Dykema and a member of the Products, Class Actions & Professional Liability Practice Group. 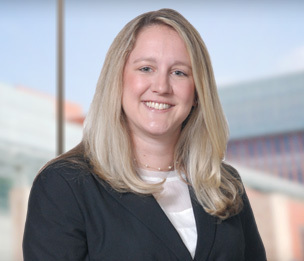 Her practice focuses on products liability, class action defense, and complex litigation in both state and federal court. Ms. Carruthers also serves clients with business and litigation needs regarding first amendment policies, consumer financial services, and healthcare. Additionally, having formal training in mediation, Ms. Carruthers uses her negotiating skills to obtain favorable settlement agreements. She is also committed to pro bono work on behalf of battered women in a wide array of matters. While in law school, Ms. Carruthers served as the Editor in Chief of Law Review, and also as an Extern for the Honorable James Plakas, 35th District Court. As a student, she achieved awards in Litigation Practice, Evidence, Insurance Law, and Franchising Law. She was also inducted into the Frank Murphy Honor Society, for graduating in the top 10% of her class. Prior to law school she was employed by Hewlett Packard as a Financial Analyst, serving their largest IT services account. Ms. Carruthers has deep experience with variance analysis, compliance, forecasting, budgeting, planning, and reporting. She also worked closely with sales and accounting managers and teams, to align financial reporting with the current and future business activity. "Guilty Plea Colloquies in Michigan after Padilla,"